Over the objections of cabdrivers, the District of Columbia is set on Thursday to scrap its seven-decade-old method of calculating taxi fares. Conventional time-and-distance meters will replace a system based on geographic zones. The District was the only major American city to base fares on how many zones a cab crossed. Many riders, particularly out-of-town visitors, found the system of 23 zones confusing. Critics said it was too easy for unscrupulous drivers to overcharge. ‘The riding public asked for a more transparent fare system, and the mayor responded,’ Leon J. Swain Jr., chairman of the Taxicab Commission, said in a phone interview. Continue reading . 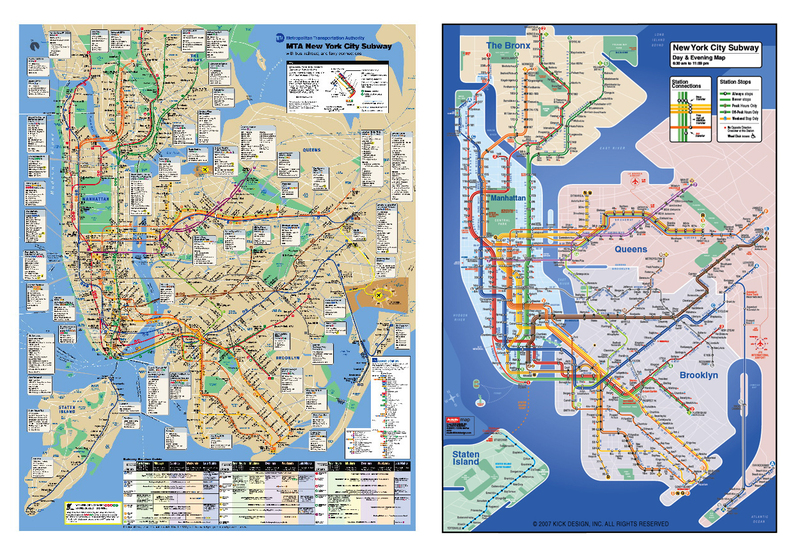 . .
Back up in New York the Times also covers a revision to the subway map made by Massimo Vignelli for the May edition of Men’s Vogue. 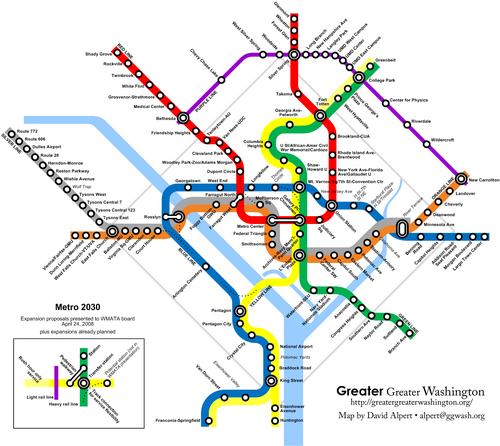 Returning to DC, the WMATA subway and bus authority considered expanding our own system after the Feds breathed new steam into the planned Silver Line from Falls Church to Dulles International Airport and beyond to Loudoun County, the fastest growing country in the US recent years. DC Taxi Fare Switch to Meters Final June 1st? The Washington Post reports today the District has won round 1 against the cab drivers in the battle over zones and meters in the nation’s capitol. (From The Washington Post) D.C. Mayor Adrian M. Fenty said today cabdrivers must install meters by the May 1 deadline or face $1,000 fines. Drivers who are caught without meters will receive a warning ticket for infractions from May 1 through May 31. They must then install a meter or the warning will convert to the $1,000 fine. Beginning June 1, drivers without meters will receive the fines each time they are caught. Taxi inspectors will conduct spot checks and the police department will assist them. Fenty (D) won a significant court ruling yesterday in favor of his plan to require time-and-distance meters in all city cabs, while taxi drivers said they will continue their legal fight to keep the decades-old zone-fare system. I published a Google Maps mashup in January (view at washingtonpost.com/taxifares/) that allows a consumer-focused price comparison between the two systems . Enter your own route or try a sample route. See the route plotted on a map and calculate your savings (or loss). The map markers can be repositioned interactively if you don’t know a street address but do know a location. I published a Google Maps mashup for The Washinton Post on January 20th (view at washingtonpost.com/taxifares/) that allows a consumer-focused price comparison between the current zone-based fare structure and the planned time-distance meter system. The tool allows a user to enter their own route or try a sample route. The approximate route is plotted on a Google Map and the prices are shown and compared to calculate the taxi rider’s savings (or loss). The map is fully interactive: markers can be repositioned if the user don’t know a street address but does know a map or satellite image location. The switchover to time-distance meters is now scheduled for May. This blog post will describe how and why the interactive taxi fare estimator was created and share who’s using the tool and determine if the zone or meter system would be cheaper based on actual usage with a sample pool of nearly 17,500 unique visitors and over 50,000 trips calculated. 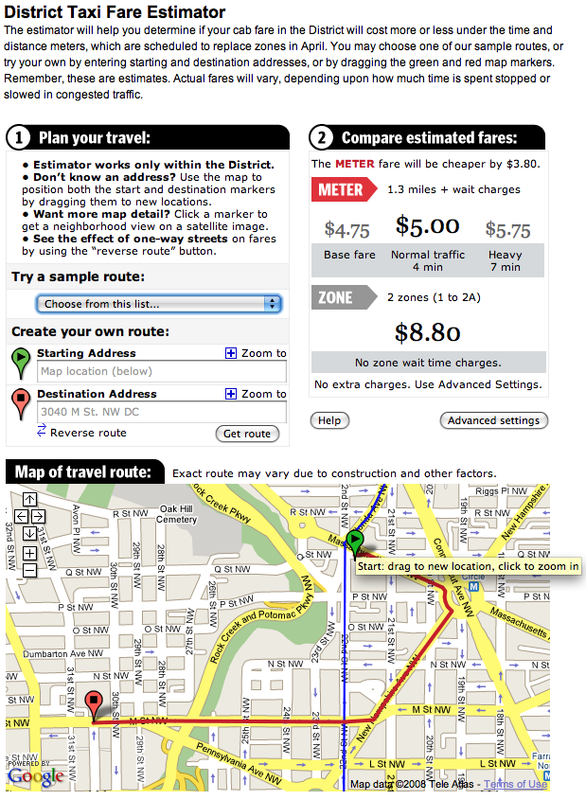 Screenshot of final Washington Post District Taxi Fare Estimator interactive. One of my bosses, Larry Nista, approached me late in 2007 about building an online tool to compare estimated prices between the zone and meter taxi fare systems. Our department had already been experimenting with simple online content this seemed like a good project to create a more complex Web 2.0 site where a user was given a higher level of interaction and meaningful, customized results. A non-work friend and I had previously talked of making a cell phone text based service for determining zone fares so this projected peaked my curiosity. It became obvious this project should be done using the Google Maps API early on and I set about learning all the different data structures and functions. At first I thought I could use web services provided by the District of Columbia GIS mapping team online, but it would still have needed to combine that with the Google Maps map tiles so I decided to do all the mapping with the Google Maps API. I used Google Maps API as it could quickly calculate route distance and estimated travel time. I could use the API to draw the map and the route line and icons interactively. Finally, I could use it to do basic map algebra like “is the start point in what taxi zone polygon” which was needed to determine the zone-based fare.